During my brief monkhood in the year 2001, I kept a diary of the experiences there. I recently rediscovered it, and I've decided to post some excerpts from it over the next few weeks. The path from birth to death is a journey without a road map. Destinations, geography, and weather conditions are all hidden from us. There are no signposts save those we have erected in our own minds, no tourist brochures save those we have ourselves manufactured with the tools of imagination. This is not a story I have ever dreamed of telling. It begins, like Dante’s Divine Comedy, though far less poetically, in the middle of the road of life … more precisely, the Sacramento Freeway, an endless-seeming expressway that arrows its way through the parched hills of Western California. It is a Friday morning in San Francisco, the morning after one of the most thrilling experiences of my career — a reception to launch my opera Madana in the United States. It has been an amazing night, a artsy loft party crammed with music enthusiasts and fans as well as potential sponsors, getting to rub shoulders with opera directors and famous philanthropists — being lionized. The next few weeks are sure to be full of exciting things. I have just made contact with a new publisher who is enthusiastic about a possible new novel. The British producer of a film based on my novel Jasmine Nights has just attached a brilliant director to the project. There is talk of new operas, new horizons. But an hour after I wake up that morning — on the drive home to Los Angeles — something very strange happens. I decide to become a Buddhist monk. Less than twenty-four hours later, I am on a plane to Thailand. A week later, I am having my head shaved and preparing to utter the first of a string of long phrases in an ancient language I can barely understand. No one expected this to happen, least of all myself. I am very much a person attached to the physical world; I am deeply involved with worldly things. I love to party. I stay up all night discussing fine music and great literature, or pounding away at one of my computers. I devour films, plays, and gourmet cuisine. In fact, the notion of monks not being allowed to eat after twelve noon has always frightened me; that’s about when I would normally wake up; I’ve always felt that if I had to live as a monk, I wouldn’t be able to eat at all since I would never be awake at times when one is allowed to eat. My lifestyle is very remote from what one thinks of as Buddhism — renunciation, detachment from desire, meditation, inward journeys. Though born in Thailand, I left when I was six months old, and was barely able to speak the language as a child; even now, I am at best semiliterate in it. In the moment that I hear the inner voice, I probably knew far more about the religions of the west — and even about Hinduism — than about Theravada Buddhism as it is practiced in Thailand. And yet, that Friday morning, comes the inner voice. “You must go to Thailand and enter a monastery.” It startles me, nodding off in the back seat of my friend’s van, as we race down the freeway through the hills of California … hills the same deep ochre that you find in the robes of Buddhist monks. I am not one to obey inner voices — or even to hear them. Yet this urge is so powerful that within moments I take out my cell phone, telephone my travel agent in Los Angeles, and book a flight for the next day. That evening, I send a fax to my parents, who live in San Francisco but are on an academic summer break in Bangkok, letting them know that I intend to become a monk. My life has been a quest without a grail… a relentless journey from country to country, gathering data, spewing out books and, sometimes to great acclaim, sometimes simply into the void … an odyssey of sorts. Perhaps I have finally arrived at the mid-life crisis I have been avoiding for so long. After all, at my age, I am still playing at being the enfant terrible, rather than the eminence grise. Perhaps it is time to change roles. Truth is a sudden thing, like lightning. I know with an unparalleled clarity that it is time to embark upon a more difficult journey, to explore that which I had never yet dared explore. At the time, I have no clue about what Buddhist monks actually do. I know that my parents will be pleased at my decision, but I don’t really know why. I know that monkhood is a rite of passage that millions of Thai men, from the King himself all the way down to the poorest peasant, have gone through; that monkhood is a cultural bond that goes beyond the elaborate class system of Thai society. But I have never felt the need to be a part of that bond. I know that monks walk around at dawn with begging bowls, but I have no idea what else they do. I know they sit around chanting those hypnotic Pali texts, but have no concept of what the texts mean, or who wrote them. I don’t even know how one goes about becoming a monk; does one simply show up at the front door of the temple with a shaved head and a bag of robes? Had I known, I would perhaps have hesitated. Ignorance, indeed, is bliss. I have a friend named Sharon who lives in a mountain hideaway in Georgia. Though she seldom ventures from her home, she speaks to dozens of people daily through the magic of the internet. She is a psychic. Not a professional, in that she doesn’t answer questions for money; but she is noted enough to have been asked by the police to help locate a murderer … successfully. Sharon goes into a trance and speaks (or types into her computer) in the voice of an entity named Tomm. Twice a week, she gets together with an online group of psychics, and she has what amounts to a convention, in which people sit around at their computers channeling in tandem. Of course, one doesn’t really know whether “Tomm” exists, or whether he has been created by Sharon’s own perfervid mind. And yet, whatever belief system one subscribes to, Tomm always seems to have something eerily prophetic to say. She describes his messages as extremely vivid images. For months, Sharon has been seeing an image of me. From time to time, she has been telling me about it. It’s me standing beside a lotus. The lotus keeps coming closer and closer. The lotus is, of course, a Buddhist symbol, but she doesn’t know this. I have told her so, but I do not see its relevance to my life. Buddhism has been the farthest thing from my mind, until this sudden epiphany. I decide to telephone her now, from the car. “I’m going into a monastery in Thailand,” I tell her. Psychics can be really smug at times. It is Sunday midnight when I get to Bangkok, and on Monday morning I go to see a very famous Jao Khun (Venerable) at one of Bangkok’s most respected temples. Since I will not disturb anyone’s privacy in this memoir, I will not use the name of any monk here, nor will I name the temple itself. It is not one of those huge tourist temples, but it is in the heart of old Bangkok, bordered on one side by one of the few canals that still has water; other, more celebrated tourist attractions are not far, and Khaosan Road, where the backpackers gather, is a few minutes away. Built by the most learned of all the kings of the Ratanakosin era, the temple is reached through a labyrinth of alleyways. A solitary gilded pagoda rears up above the pointed eaves, richly tiled in crimson and viridian. The Jao Khun’s kuti, or dwelling place, is a few steps away from an unpretentious noodle stand; a swinging metal gate is a secret entrance to the complex. I am destined to enter the inner world through a back door. This particular Jao Khun has gained fame as an astrologer, and so I call him the Seer. 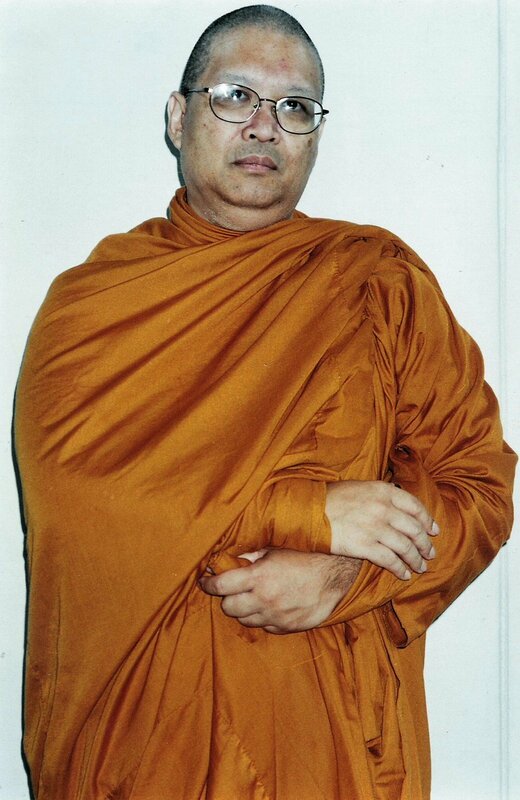 He has dedicated his life to the monkhood since his early twenties; now in his seventies, he has created quite the fiefdom within the monastic world. He has done so by obstinately refusing to accept money, unlike some other well known clerics in Thailand; when people ask to donate large amounts of cash to his charitable projects, he tells them to keep the money in their own name, letting only the interest be used for the charities. As a result, he sits atop a towering pyramid of resources, and has endowed scholarships for poor children, built Thai temples in the U.S. and Scandinavia, and has created a temple with an accompanying school for young novices outside Bangkok. As senior monks go, he is considered something of a saint. This is my first indication that becoming a monk isn’t simply a matter of ringing the bell at the temple gates and shaving one’s head. It seems there is a complex ritual involved, and I must formally ask, not once but three times, to be admitted into monkhood … and that I will be officially interrogated as to my qualifications by two senior monks. The language of all these exchanges is Pali, a language of ancient India. The Lord Buddha didn’t want to use Sanskrit, the language of the Hindu scriptures, as the language of his revolutionary new philosophy, because twenty-five hundred years ago this was already an ancient language. The idea of using Pali was that it was, at the time when Buddha walked the earth, a spoken language which people could immediately understand. The situation is somewhat analogous to the use of Latin in the Catholic Church up until the middle of the Twentieth Century; the Latin translation of the bible was called the “Vulgate” because it was in the vulgar tongue, that is to say, the language of ordinary people. As the centuries passed, these “common languages” became more and more uncommon. And thus it was that I found myself staring at a lengthy and enigmatic text, wondering when I would have it committed to memory enough to gain admittance to the inner world. My next hurdle is an interview with the Lord Abbot of the Monastery, who wields great power within the walls of that world. The abbot is a stickler for tradition; he is also an extremely famous meditation guru, whose 7-day meditation course has earned him enormous attention in this country and even abroad. Here I shall call him the Guru. The guru is gruff at first. He complains about my posture, my manner of performing the five-point prostration, a traditional gesture of respect towards the Buddha and his living representatives; and he tells me he won’t put up with becoming a monk just for a lark. “I want you to take Buddhism seriously, and I want you to enroll in my seven-day intensive meditation workshop starting on day one,” he tells me. I explain to him how the insistent inner voice sent me on this journey, and how I really know nothing at all about what I am about to experience; my mind is a blank page. Only later do I realize that this grisly tale is intended as a prelude to the formal meditation on the impermanence of the physical body. Then, sensing my despair, he teaches me a trick for sitting in the awkward phabphieb position. At my age, and never having had to sit in those positions, it’s weird, but to my astonishment, the guru’s trick actually succeeds in allaying my discomfort for some minutes. I begin to suspect that beneath his punctilious exterior he is a compassionate soul, full of tenderness and concern. Nonetheless, the Pali text, with its lilting rhythms and strange consonant clusters, almost makes me give up. As the dreaded day approaches, and my relatives all get in on the act, worrying about what I shall wear and who will supply the robes and begging-bowl, I become decidedly conflicted about the whole thing. I try placing the text under my pillow, thinking that perhaps I will absorb its contents while I sleep. Just before dawn, I awaken from an astonishingly vivid dream. As I awaken, I realize I am no longer afraid. I have been told, with an absolute clarity, that I must incinerate the past, that I must go forth into this unknown world. “Let them go.” The dream teaches me the first and final lesson of Buddhism. The easiest to say, the hardest to put into practice. I must allow all those bones to crumble into dust … not just the fear and the emotional turmoil, but even the good things, the successes, if I am to undergo this special kind of rebirth. And so it is that I begin the journey, leaving behind all the familiar landmarks of a convoluted life, Although it is only for a few days, I must give up all my possessions, even my identity. The time will be short, but it will encompass a life’s arc of experience, from birth to epiphany to death to rebirth. It is time. We have parked at the back gate of the temple. I am dressed in white, the color of an unwritten page, of new beginnings. The gate begins to creak open. It takes incredible courage, empathy and love of your fellow "traveler" to share thoughts this intimate. My gratitude to you is enormous. I have approached the "gate" on more than one occasion, and have not found the courage to open the door and cross the threshold.